A young child's modern classic, a book by Julia Donaldson and Axel Scheffler tells the story of a small mouse who enters The Deep Dark Wood and scares off the mouse's natural predators by inventing a Gruffalo. To the mouse's surprise, the Gruffalo is real and wants to eat the mouse, until the mouse has the guile to show the Gruffalo that the mouse's predators are scared and they become friends. Of course you have to be of Infant School age (4 - 6 years old) to truly enjoy these stories as that of course is their catchment age range, and for this afternoon's stage adaptation by Tall Stories Theatre Company, this age range and perhaps a little older formed the majority of the audience. On entering the auditorium we were greeted with a very pleasing open set of quasi-realistic trees and a backcloth representing the wood. Very child-friendly and non-threatening, and combined with SFX bird-song it put us all in the mood for this one hour long non-stop performance. Enter Mouse, played by Lauren Scott-Berry, who proved to be a very personable and likeable mouse, but totally failed to engage with the audience at the beginning even when given licence in the script to do so. Her first words were 'Oh hello! I said, hello!' inviting the children to respond and react. They did, half-heartedly, and then she left it at that and we were immediately plunged into scare territory, where she is in The Deep Dark Wood, there is little light and she is acting very scared, with mood music to accompany. This was definitely too much too soon, and it made it much harder for the three actors on stage to bring the audience back on their side. They did eventually manage it, but it was a struggle, and a little too late. That's a real pity, because it was not the actor's fault. This was due to choices in the adaptation and directing. There were two other actors in the play this afternoon. 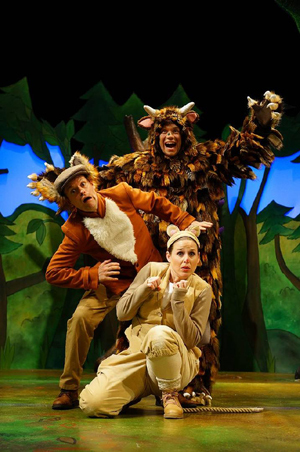 One who played The Fox, The Owl and The Snake (Alastair Chisholm), and the other playing the storyteller and The Gruffalo (Aaron Millard). I enjoyed their performances, and laughed loudly at their corny and silly puns and jokes. Sadly, I was one of only a handful who did, and they were all adults, as most unfortunately majority of the spoken humour in the play was way too far above the target audience's knowledge and understanding. They could only laugh at the physical humour, of which there was precious little. There were plenty of songs in this hour long show too. Many of them sounding quite similar, and most going on too long. They had certainly lost the interest of the youngsters around where I was sitting half-way through most songs. Everyone liked the snake's up-beat, maraca playing and hip swaying though. Judging once again by the target audience's reactions to this play and their mild and somewhat insipid response to the curtain call, I can only assume that they felt very much the same as I did, only they were unable to put their feelings into words. It was a nice idea, and the three performers worked hard and gave consistently good and enjoyable performances, but they were battling against a very poor adaptation and unimaginative direction (Olivia Jacobs) geared at too high a level, not involving the children enough, and not fast-moving enough.